Announcements are used to inform site participants of current items of interest. The most recent announcements can appear on a site’s home page and they can be sent via e-mail to site members, in addition to being posted on the site. Various media, such as URL’s, documents, photos, etc. can be attached to announcements. When users click on the attachment link, the item will open in a new window, or the user will be prompted to to open the document, or it can be saved to the desktop. It depends on the attachment type and how the user’s browser is configured. When you are in a course site, you will only be able to view the current course’s announcements. To see global announcements from all the sites to which you belong, go to your Dashboard. On the right hand side column, you will see the most recent announcement from each of your active (published) sites that you are a member of. When you click on Announcements in your sites, the page shows a list of all announcement subjects, who created them, and the date each was created. You can sort the list by clicking on any of the headings. To switch the list from A-Z to Z-A format (ascending/descending), click on the little pyramid icon next to the heading. To preview the contents of a particular announcement, click once on the “View” icon to the left of the subject. If an announcement has an attachment, click on the link to access the attachment. If it is document of some sort (PDF, Word, Excel, etc. ), it may ask you what program you’d like to use to open it or ask to save it to the desktop, or it may not give you the option of doing anything but saving it to the desktop. See the lesson on Attachments for more information on how to work with attachments. If the attachment or resource is a web page, it will automatically open in a new window. Click on Return to List to go back to the Announcements list. Click on Announcements on the left menu bar of your site. Click on the Add link in the menu bar. In the dialog box, enter a title for your announcement and in the larger box, type the message. Notice that you can format your text however you like. When sent via email, the announcement may be in plain text, however, depending on the students’ email client software. It their email supports HTML, they will see your formatting. Check the radio button Display to Public if you want your announcement to be viewable to people not enrolled in your site. Otherwise be sure the Display to Site button is checked and the announcement will only be viewable to site participants. You may set a future release date for your announcement, if you like (see next section). You can add any number of attachments, and they can be any combination of local files, websites, and resources. For more information, go to the lesson on Attachments. If you want your announcement to be sent to all site participants via email, set it to High Priority. The default is to NOT send an email. There is also a Low Priority option which sends the announcement to users who haven’t opted out of getting email. When you’re done creating your announcement, click on the “Done” button. If you want to see what it looks like before posting it, click on the “View” button. If you’re not ready to post the announcement, you can click on “Save Draft.” And if you don’t ever want to see this announcement again, click the Cancel button and it will not be saved. You may embed links, images and other media in your announcements. If you include embedded images in your announcements and you want these to be visible to your students in the email notifications that you may push to their personal in-boxes, you can achieve this by embedding images that are set to “public”. If the images are uploaded in the announcements of your site, they are private by design (visible in the site ONLY) and won’t be viewable in the email. You may set future “release” dates to your announcements (optionally). This feature allows you to preset when you want an announcement to be posted (on its own) and have an email notification (optionally) be sent to your students. Here is a common use case scenario for this feature: You want to send out an announcement early on Monday morning but you’d rather not wake up at 6:00am to post it. Or, you’d like to post an announcement on Friday evening, but you’ll be at a party. You can set the “release” date of your announcement, and it’ll go out on its own. The field for setting “release” dates is right below the announcement edit box (see Release Date). If you want to post an announcement right away, simply leave the “Release Date” field blank and click on “Done”. You may add release dates to ‘drafts’, in preparation for a future posting. Release dates are preserved upon “import from site”. Note: Email notifications go out within 10 minutes of the post date / time, as per the interval that Etudes runs these jobs. There are no restrictions in revising posted announcements or reposting them. If you want to revise a previously posted announcement AND repost it, change the “Post Date” to a new date or leave it blank (clear out an earlier date) to repost right away. You may choose to send an email notification to students again or just post it to the site so that students see it when they visit the course. By default, announcements are sorted by release date – with the most recently posted announcement at the top. This is the preferred method as it requires no effort from your part. The system will automatically sort your announcements in the order that you post them. Announcements can also be sorted manually, if that’s desired. However, keep in mind that once you sort your announcements manually, you will not be able to take advantage of the automated sorting by release date, anymore. You will have to always adjust their order manually. To sort an announcement manually, drag and drop an announcement to the desired location by holding down with the mouse the up/down arrows. 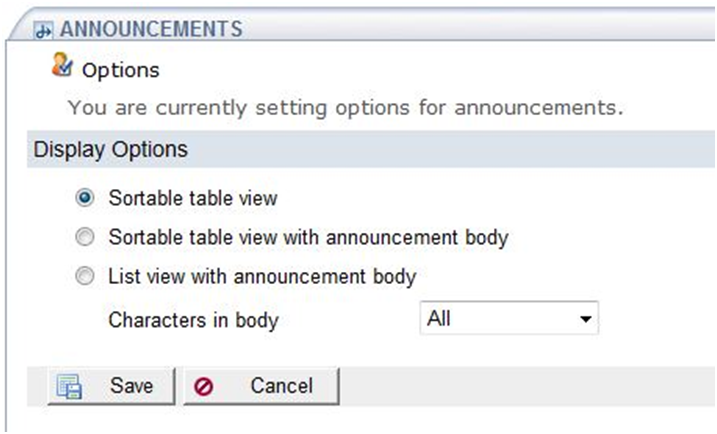 Once announcements have been sorted manually, numeric drop-downs also appear and you can use them to further adjust the location of announcements. Do not forget to click on ‘Save’ to save your new order! Once announcements are sorted manually, the ‘by release date’ sorting is no longer available. The new positions take effect. The new manual order is reflected under Announcements and in Recent Announcements in your Home page. Any new announcements that you post will be added to the very top, regardless of the release date. If manual sort is used, when editing an announcement and saving it, it will remain in its position, regardless if the release date is changed. Also, import from site will respect the adjusted positions and will carry them over to your new site. If you want announcements to be sorted automatically by release date, do not reposition them manually. You may post a “welcome” (or other) announcement to your students with “high-priority” email notification, even if your site is unpublished and not yet accessible to students. A copy of the announcement will be posted in the site and your students will get a copy of it in the email address of their account. You can send a high priority announcement to specific groups only, if you’ve set up groups in your site. 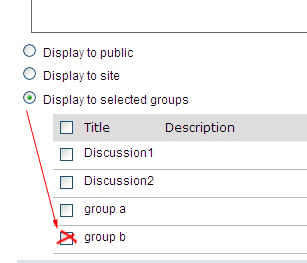 Choose the Display to selected groups radio button. Then check on the box(es) for the groups you want to send this announcement to (or make it visible to). Click on Announcements on the left menu bar. Click on the announcement you want to edit. Make your changes and then click the appropriate button at the bottom of the page: Done, View, Save Draft, or Cancel. A published announcement is one that has been posted and is available to students for viewing (if the release date has been reached). An unpublished announcement is in ‘draft’ mode. You can publish or unpublish many announcements at once, by checking the boxes to select them and clicking on the Publish / Unpublish buttons. In the list of announcements, place a check in the box on the LEFT side next to all announcements you want to delete. Click on the Delete button. You will be asked to confirm the deletion. Click Delete if yes; click Cancel if no. By default, announcements are sorted by “Release Date”, with the most recent announcements listed first and the oldest last. Drafts are listed at the bottom, again sorted by release date, or by modified date, if no release date is specified. You can click on the “Modified” header to sort their announcements by last modified date. Lastly, future announcements (pre-set to be posted at a future date) are displayed in a light gray color so that you can tell visually that they are set, but not yet posted. If you won’t use some of your announcements during a term, you can archive them and get them out of your way. To archive an announcement, check it and then click on Archive at the menu. Archived announcements get copied with import from site. You won’t lose them. To preview archived announcements and restore them to the active list, click on Restore. Restored announcements come in as drafts. Archived announcements don’t participate in the ‘base date’ feature. If you have old announcements that you won’t use, archive them before running base date. This way, the old dates won’t interfere with base date. Merging announcements is designed to be used in sites where members belong to both sites. If students from one site don’t have ‘permission’ to view the content of another site (they are not registered for both courses), just because you merged announcements from another site, they wouldn’t be visible to users who are not in both sites. Merged announcements won’t appear in the Recent Announcements area on the Home Page. To merge announcements, click on the Merge link at the top of the Announcements page, then click on the courses you want to merge announcements from and then click on the Save button at the bottom of the window. The announcements from that class will now show up in this site’s announcement page. You can see from the Site list which classes the announcements originated from. If you decide to “unmerge” announcements that were merged in from another class, click on the Merge link at the top of the Announcements page, uncheck the box(es) for classes whose announcements were merged here, and click Save at the bottom of the page. A more useful feature than Merge is to Import from Site. This feature, explained in detail in the Site Info Module, allows you to import announcements from one site into another. In this case, it is more like copying from one place to another. All students will be able to view the imported announcements as fresh copies will now “belong” to to the new site. Please refer to the module on Site Info for more details on “import from site” for Announcements. This is a place where you can set up how announcements look. Click on Options. There are three choices: Sortable table, sortable table with body, and List View with body. These are shown below in order. The sortable table view with announcement body is a good choice for allowing your viewers to see announcements at a glance, but it takes much more room, depending on how wordy the announcements are. The third choice, list view, also shows the announcement body. It just looks a bit different from the previous two. In this area you can check off options for each type of user. Students, by default, have “access” privileges, so they can read announcements but not create or edit them. It is highly recommended that you don’t alter default permissions. Click on View at the top menu bar to see your students’ view of your announcements. You will notice that drafts and any announcements that are set to open in the future are not listed. Click on Return to return to the instructor’s list of announcements. Note: This view applies to what the entire class sees, and not specific group announcements.